THOUSANDS of people in Northern Ireland have been jailed for failing to pay fines for crimes which include begging, failing to wear a seatbelt, dangerous cycling, dropping litter and not having a TV licence. Up until earlier this year hundreds of people continued to be given jail time each month for non-payment of outstanding fines of as little as £5. However, much of the fine default penalty system is currently in limbo as a result of court proceedings earlier this year which questioned the legality of sentencing people to time behind bars for failing to pay fines. Meanwhile, the Department of Justice says a proposed service with new powers to collect fines and reduce the need to imprison defaulters is unlikely to be in place until 2015. As a result of the judicial review process, from February to June of this year there were only 192 committals to prison for fine default. The Detail requested data on fine defaulting from the Department of Justice to see what, if anything, has changed since we last examined this issue in December 2011 – click here. The figures we received show that over a 20 month period from November 1 2011 to the end of June this year, there were 4,276 committals to prison for fine defaulting. This is despite Justice Minister David Ford stating back in 2011 that sending thousands of people each year to prison for non-payment of fines was “unsustainable”. The number of people jailed for fine default only dramatically reduced in February of this year as the result of two important court judgments which found that the long established practice in Northern Ireland for dealing with non-payment of fines “failed to comply fully with the legislative provisions”. The Department of Justice has confirmed that all outstanding warrants have been recalled from the PSNI. Enforcement action has stopped until warrants are reviewed and new procedures are established to bring defendants back to court for the purpose of a default hearing. Fine default warrants are not currently being issued, except for “forthwith warrants”. Judicial review proceedings to clarify the process for default hearings are underway. Last week, the Northern Ireland Audit Office reported that as of March 2012 fines totalling more than £19m for offences including speeding and illegal parking had not been paid. Speaking in December 2011, Justice Minister David Ford told The Detail that the number of people going into custody for the non-payment of fines was unsustainable. At that time around 2,000 people were being sent to jail annually for fine defaulting and they made up around a third of total prison admissions. Last year Criminal Justice Inspection (CJI) repeated its call for the implementation of a robust and effective enforcement process to be put in place to minimise the “inappropriate and expensive use of police and prison resources in dealing with people who default on the terms of a court order”. Despite work undertaken since its initial report on this issue in March 2010, CJI said in 2012 that overall progress in reducing the number of people sent to prison solely for fine default has been slow, with new committals to prison for fine default rising to 2,179 in 2011 from 1,247 in 2009. Our new figures show that there were 3,287 incidents recorded during 2012 alone of people serving time in prison for fine defaulting. The response to our Freedom of Information request shows that between November 1 2011 and June 30 2013 there were 4,276 incidents of people being jailed for fine defaulting. The prisoners’ crimes include failing to pay fines for begging, failing to wear a seatbelt, dangerous cycling, dropping litter and not having a TV licence. For each individual case, the Department of Justice has provided us with the gender of the prisoner concerned, their age group, a description of their offence and the balance due on their fine when they were taken into custody. 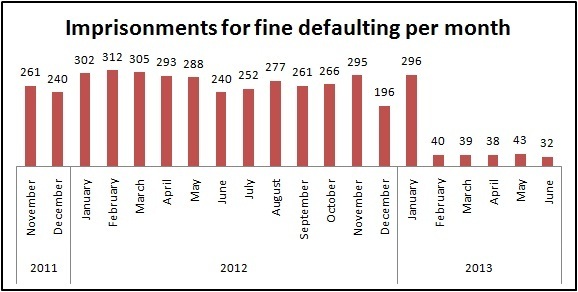 Some individuals may have been in jail for fine default more than once during this time period. The unpaid fines leading to jail terms since November 2011 range from £5 to £75,000. The average fine amount was £336.65. 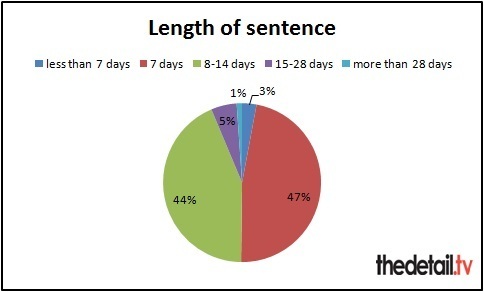 The sentences imposed by the courts ranged from just one day to 730 days. 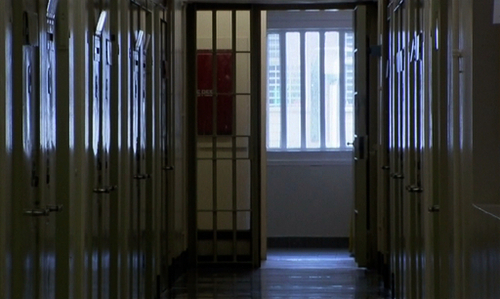 It has been estimated that it costs £3,000 for a four-day committal of a prisoner. Fine default prisoners typically serve a third of their sentence. Between November 1 2011 and January of this year, an average of 272 people were sent to prison every month for unpaid fines. Then in February of this year, the number dropped dramatically to 40 committals. Between February and June an average of only 38 people each month were imprisoned for fine defaulting. Of the total 4,276 imprisonments from November 1 2011 to the end of June 2013 covered by our Freedom of Information request, 91% of the people sent to jail were male. A total of 221 people spent time behind bars for failing to pay fines for having no TV licence – their time to serve ranged from 6 to 28 days and the balance outstanding on the fines ranged from £77.46 to £846.75. The length of sentence handed down ranged from one day for five cases (including one for not paying fine for no car insurance) to 730 days for a man in his 40s for the case involving the largest unpaid fine of £75,000 for “fraud by false representation”. Ninety of the cases involved fines of less than £50 – including two less than £10 – and 87% of the outstanding fines were less than £500. People were jailed for not paying fines for assault, drink driving, indecent behaviour, sexual assault and possession of drugs. A man aged 18-20 was given a seven day sentence in September 2012 for not paying a £50 fine for having a dirty windscreen. In May 2012 a man in his 30s was given a seven day sentence for failing to pay a £50 fine for parking on yellow lines. 11 men were jailed for not paying fines for begging. Five parents were given 14 day sentences for not paying school attendance fines. Their unpaid fines range from £255 to £405. As with the data we examined previously, there were some notable differences in the sentences given for similar crimes. One man in his 30s was given a 179 day sentence in November 2011 for an unpaid fine of £5,555 for theft, while another man in his 30s was told he would serve a much shorter 92 day sentence for not paying a theft fine of £4,575. In November 2011 a man in his 30s was given a custodial sentence of 14 days for failing to pay a £505 fine for driving while disqualified. Eight months later a man in his 50s was told he would serve a harsher 28 day sentence for not paying a £506 fine for the same crime. In June 2013 a man in his 20s was told to serve one day in jail for not paying a £300 fine for using a motor vehicle without insurance. Two months earlier a man aged 18-20 was given a 14 day sentence for the same crime and exactly the same amount of fine outstanding. The Department of Justice has confirmed that the dramatic reduction in the number of people entering prison on fine default is as a result of two judgments given by the Divisional Court in March 2013. They found that the long established practice for dealing with non-payment of fines and other monetary penalties “failed to comply fully with the legislative provisions”. A spokesman for the department said: “Following this judgment all outstanding warrants have been recalled from PSNI and enforcement action stopped until warrants are reviewed and new procedures are established to bring defendants back to court for the purpose of a default hearing. Fine default warrants are not currently being issued, except for forthwith warrants. “The judgment does not question the validity of outstanding fines. Further judicial review proceedings to clarify the process for default hearings is underway and when the new procedures are in place, NICTS officials will work with the judiciary to ensure cases are listed before a court to enable the Judge to consider how to deal with non-payment of fines. A link to the summary of the judgment can be accessed here. We asked for an explanation of “forthwith warrants”. A department spokesman said: "In relation to forthwith fines, the Magistrates’ Courts (NI) Order 1981 provides that a person who is fined shall either be given time to pay (between 28 days and 26 weeks) or an instalment order. “However it provides that in certain circumstances the court may order that the fine be ‘forthwith’ i.e. that the person must pay it immediately or be committed to prison for non-payment. 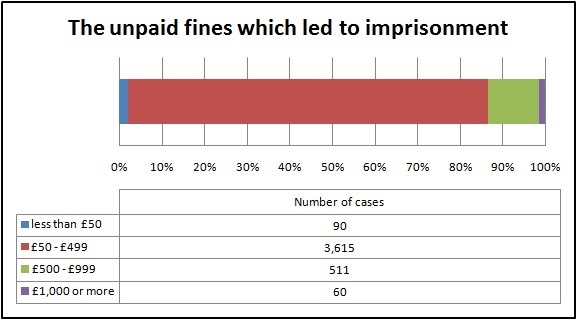 Only 192 people were given a prison sentence for non-payment of fines between February and June of this year. A man in his 20s given a seven day sentence for failing to pay a £5 fine for not having a driving licence. A man aged between 18-20 who didn’t pay a £15 fine for failing to wear his seatbelt. A man in his 20s given a seven day sentence for failing to pay £50 fine for begging. The largest fine resulting in jail was £1,000 for burglary for a man in his 30s. He was given a 28 day sentence. Ninety-eight of the cases were motoring offences. No one was jailed between February and June for failing to pay TV licence fines. The DoJ said that two Supervised Activity Order pilot schemes took place in Newry and Lisburn between January 2012 and April 2013 and provided an alternative to imprisonment for fine default. These schemes have now been concluded and evaluated. The spokesman continued: “Proposed legislation is being brought in the Fines and Enforcement Bill to establish legislative powers for a new Fine Collection and Enforcement Service. “It is intended that the new service will be operational in 2015 with a range of powers to collect and enforce fines including attachment from earnings and deductions from benefits. The department added that “more than half” of fines imposed are paid without the need for enforcement action and that NI Courts and Tribunals Service operates the Fine Collection Scheme (FCS) to encourage payment of fines. Current performance figures from the FCS indicate that Fines Officer intervention has resulted in 28% more defendants making payment without the need for further enforcement action. The prison sentences handed down to all fine defaulters during the 20 months covered by our request total 52,550 days. Fine defaulters serve on average a third of their sentence which would equate to 17,516 days. It has been estimated that a four day committal costs £3,000 so we estimate the total cost of the fine defaulters’ time in custody – covered by our request – adds up to £13,137,500. The prisoners’ unpaid fines are also written off when they serve their prison time. The unpaid fines covered by our request total £1,439,522. So this adds up to a total estimated bill of a minimum of £14.6m for the 20 month period covered by our request. Of this figure, £720,229 is down to the prison costs and fines written off for TV licence evasion alone. It added that it is anticipated that £6.5m of this will never be recovered. Serving prison time is one way to ‘clear’ a fine. We asked Brendan McGuigan, chief inspector of Criminal Justice in Northern Ireland, for a comment on our new figures. He said: “Fines are the mainstay of the criminal justice system and are by far the most frequently used penalty in Northern Ireland’s Courts. “Fine enforcement represents a significant part of the criminal justice system and public confidence often depends on the effectiveness of the system and whether people believe justice is being done. “Criminal Justice Inspection Northern Ireland (CJI) has recognised that using police and prison resources to deal with people who default on court orders is expensive and places a significant strain on the public purse. Mr McGuigan said that there is a need to ensure the system that exists in Northern Ireland maximises compliance while simultaneously minimising the need to resort to either police enforcement or imprisonment when a person defaults on the terms of a court order. “This is why changing the current system is vital,” he said. The chief inspector said that a robust effective enforcement system would also help to deal with the problem of those who seek to abuse the system by actively choosing imprisonment to avoid payment, incurring further public expense. CJI has welcomed the fact that government ministers and the Department of Justice have acknowledged the need for reform. And Mr McGuigan said that the establishment of the Fine Enforcement Project Group and work carried out by the Northern Ireland Courts and Tribunals Service (NICTS) to take forward the issue of fine enforcement, has also been positive. “The Inspectorate supports the work underway in the Department of Justice to establish legislation to provide for Supervised Activity Orders and introduce a new civilian fine enforcement agency, similar to that in England and Wales, with the power to collect and enforce fines including attachment from earnings and deductions from benefits. “We will be studying the recently published Northern Ireland Audit Office NICTS Trust Statement for 2011-12 which has looked at the collection of unpaid fines and reflected the concerns previously highlighted in our inspection reports. The Northern Ireland Association for the Care and Resettlement of Offenders (Niacro) said that now is the time to seize the opportunity to develop a local solution to a significant local problem. Niacro’s chief executive Olwen Lyner told The Detail: “As the figures uncovered by The Detail reveal, there has been a huge reduction in the numbers of people being committed to custody for defaulting on fines since February 2013. “This results from the judicial review ruling, issued earlier this year, which determined that the practice of automatically imprisoning people for non-payment of fines was unlawful. She continued: “This is not just about the ‘rights’ and ‘wrongs’ of imprisoning people who can’t pay fines for such offences as begging or not having a television licence, but in these times of austerity, it is a serious issue of public expenditure. “How many people would consider that a system of imprisoning people over 4,000 people, that costs over £13million to administer, which writes off approximately £1.4million in unpaid fines, and has significant additional costs in terms of the impact of imprisonment on families and children, is really the best way of dealing with this issue? Ms Lyner said Niacro hopes that the DoJ will seize the opportunity to distinguish between the small numbers of people who won’t pay such fines, and the more sizeable numbers who simply can’t. “This can be for a whole range of reasons, such as loss of employment, sickness or lack of financial capability. “However, we believe one of the most crucial reasons is a lack of flexibility on the part of government bodies who enforce such fines to enable people to make manageable and regular payments through simple and familiar methods, similar to mobile phone top-up schemes for example.